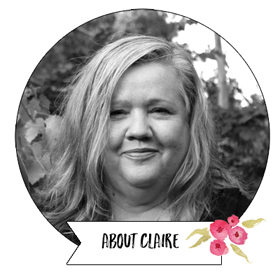 I had planned to say this Stampin' Up! French Foliage male birthday card was inspired by Autumn, but we're just 2 days away from winter here in the Melbourne! We have had some cold days and pouring rain at school pick up time. Why is the rain always heaviest at pick up time? This was a card I made recently as an extra sample for the girls in my Technique Club. I wanted to demonstrate the different effects you could get with colouring the rubber of the stamps with Stampin' Write markers. The background panel stamps were coloured and then misted with a couple of sprays of water before stamping onto watercolour paper. The front leaf did not have any misting. I think this would be fine for a male birthday card don't you? My colours are Early Espresso, Always Artichoke, Cajun Craze and Pumpkin Pie. These are great colours for Autumn. 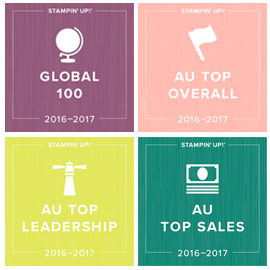 Tomorrow morning I'm heading off to Canberra for the 2012 Stampin' Up! Convention. 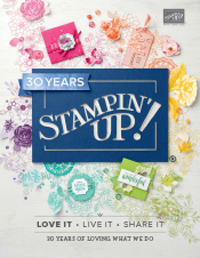 I'm really looking forward to catching up with Shelli, the Stampin' Up! staff from US and Australia and of course all my fabulous team and demo friends. Convention is awesome! I'll be sure to post when I get back, but for snapshots of action along the way, be sure to like my Facebook Page (right hand column over there ->) and you won't miss a thing. Attic Boutique Designer Series Paper - great for scrapbooking and cards! Just love the colours in this gorgeous Attic Boutique DSP from the Stampin' Up! Autumn Winter Mini Catalogue: Pool Party, Soft Suede, Poppy Parade and Daffodil Delight. There are both delicate prints and more bold prints in this paper pack, so I found it versatile for both scrapbooking and cards. This scrapbook page is about our recent mini break to Apollo Bay. We had some lovely family time doing low key stuff like walks on the beach, going to the park and just relaxing. I love a beach holiday. The Stampin' Up! Pennant Punch is perfect for creating banners with stamped titles. This alphabet stamp set is called Just Perfect which is aptly named as it's the perfect size for stamping on the pennant flags from this punch. I also popped a little 2 step-bird on top of the banner, like a bird on a wire! Here's a card I made using the same Attic Boutique DSP. I love the dress form stamp from Stampin' Up! 's Established Elegance stamp set. Can you spot the pearls I have added too? If you love this paper, it's part of this months Paper Party. Join my team for the new lower price of $169 and you can choose (your choice!) a free pack of DSP every month (including from those yet to be released) from June through December. That's seven packs of free DSP worth over $132 total. If I can help you with either of these great deals, you can call me on 03 9735 2946, or email me. As promised, here's another card using the gorgeous Tea Shoppe stamp set from the Stampin' Up! Autumn Winter mini catalogue. This time I have paired it with the Twitterpated Designer Series Paper, some of the matching prints patterned paper in Riding Hood Red and Baja Breeze, and some Blushing Bride pleated ribbon. The Twitterpated floral paper was cut using the Framelits for the BigShot, and I used the Stampin' Write Markers in Basic Gray, Blushing Bride, Riding Hood Red and Baja Breeze for my greeting. Hope you like todays card. 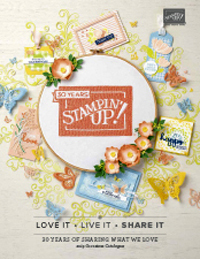 To see some more samples and go into the draw to win a Stampin' Up! clear mount Tea Shoppe stamp set, head over to my Facebook page (just click the Facebook badge in the right hand column). I have some cards in there that are some absolute favourites of mine. So I thought I would take a quick trip down memory lane and post some of my favourite cards from 2011. This one was a favourite for a few reasons. It truly reflects my love of vintage style, I just LOVE the dress form stamp from the Stampin' Up! Established Elegance set, and I loved how the colour combination of Always Artichoke and the Pretty in Pink came together. This next one I love mostly for the texture I was able to create using the embossed fabric. I also love how the colours of Soft Suede and Perfect Plum come together. This set is called Clearly for You. This one I can best describe as being a favourite purely for the way the elements of Stampin' Up! Creative Elements stamp set came together. It was one of the first cards I made using the First Edition DSP and it's one of my favourite go to items for card making. Gives a neutral touch, without being too start IYKWIM? This one I love for the colours. A Marina Mist background, with Whisper White, Old Olive and Rich Razzleberry. I think I also like the mix of tone on tone stamping with the crispness of the stamping on Whisper White. This Stampin' Up! set is called Nature Walk. These cards were very simple, but I really liked how you can make a statement with a simple embossing folder and a strip of patterned paper. Now a couple of my favourite Christmas cards from last year. This set is called Merry and Type. As this a contemporary style set, I used brighter colours in Lucky Limeade and Island Indigo. Again I have used some tone on tone stamping, but also added some silver embossing and coloured the greeting stamp with Stampin' Write Markers to coordinate. Finally, a very vintage Christmas card using the Petite Pennants Builder punch and Welcome Christmas stamp set. I hope you enjoyed this trip through my favourite cards of 2011 in my galleries. I'll be back later today with a new card using Tea Shoppe as promised. There is just something about a good cup of tea isn't there? I can almost feel my body say 'ahhhhhh' when I drink it, some precious me time or sitting on my patio. At other times it coincides with being surrounded by friends and family (my favourite times). Then there is the times of utter sadness or disbelief, when offering someone a cup of tea seems all you can do. I remember this moment clearly the minutes after I had just received a call at work to say my father had died suddenly in a road accident over 16 years ago now. I had only just arrived in Melbourne and been at my new job 4 weeks, and a coworker made me a cup of tea which was so comforting. But this post isn't about sadness, it's about a cup of tea and the lovely stamp set in the Autumn Winter Mini catalogue called Tea Shoppe (watch out below for details of how you can enter to win the clear mount set over the next few days! ), which so suited my style and my emotional connection to a good cup of tea. This morning I even got out the best tea china, the Royal Albert Old Country Roses my sister bought us as a wedding present and enjoyed my cup of tea in that. I must confess the milk jug was purely for the photo as I poured it straight from the carton. You will also see my trusty Lipton tea bag there, my tea of choice. I love it tells me on the back that tea is a good source of Theanine (an antioxidant), so I'm not only doing my mental health a favour, but my physical health too. Double whammy. Now let's get onto the card right? Well given my love for a good cup of tea, as soon as I saw the beautiful Stampin' Up! Tea Shoppe in the Autumn Winter Mini, I knew it was for me. Straight away I new I wanted to make an emboss resist card on a beautiful patterned paper, reminiscent of a lovely tea cup. Here's what I came up with. This Designer Series Paper is Stampin' Up! Attic Boutique, one of the paper sets you can get free when you buy 3 DSP packs this month. First I clear embossed the image onto the DSP and then I brayered Soft Suede over the top, polished with a paper towel when dry and cut around the image. For the raised flowers, I just stamped the image in Soft Suede onto some of the Pool Party DSP and cut around them. Here's a close up showing how I have popped them up and added a pearl. My frames are made with the versatile Framelits, and the greeting and border are also in the Tea Shoppe set. Would you like to win the Tea Shoppe stamp set? I have lots more Tea Shoppe projects to show you this week, and also have a clearmount set of this gorgeous stamp set to give away on my Facebook page. Below is a pic of the wood mount set so you can see the images, but I am giving away the clear mount set valued at $49.95 on Sunday night. To enter (Australian residents only, sorry to my overseas readers ), head on over to my Facebook page, and either 'like' the image of another Tea Shoppe card I have just posted or 'like' my page for other samples and competitions. That's all you need to do. I'll announce the winner Sunday night on my Facebook page. I'd love for you to be the winner, so head on over to my Facebook page and 'like'. the new card I have posted over there. Back soon with lots more Tea Shoppe ideas. I'd love to hear more about your favourite tea stories, your favourite teacup, your favourite brew maybe? Let me know! Sign up to my monthly newsletter to get more exclusive ideas and samples from me (just enter your details top of right hand column - I will share your details with anyone). Join up to get a free DSP pack of your choice every month between June and December (that's over $132 worth and it now only costs $169 to join. Email me or call me on 03 9735 2946.